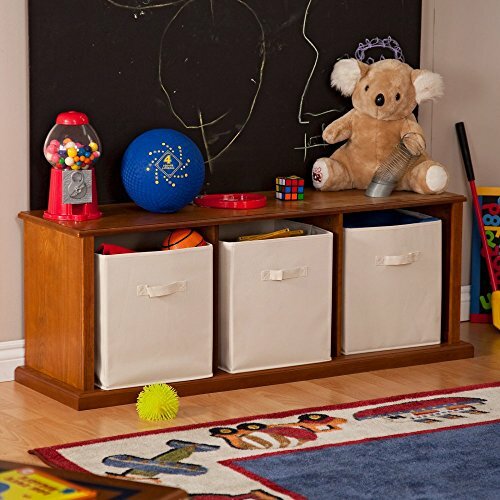 Both accessible and concealed, your tot's toys are never too far off or too in the way with the Classic Hopscotch Storage Bench - Pecan. The simpler it is for kids to clean, the less likely they are to argue about it. And with this bench's easy, open storage, kids can clean up in minutes by tossing everything into the three included canvas bins and sliding them out of sight. This modular bench is dual purpose, as it provides both sitting space and storage. It's also stackable; purchase multiple units to create your ideal storage solution. Rounded corners and molding on the edges provide the stylish, child-friendly look you crave. The durable vanilla-colored finish has a warm, rich antique look with a classic appeal that pairs well in any décor. Resilient engineered wood will prevent warping, breaking, and general wear from destroying the original appearance. This staying power exists in more than the construction, however, as the design can be used for any purpose, not just a child's bedroom. In a playroom, guest bedroom, or even a public space, it makes a great addition for both sitting and storing.